Beho Beho was the first camp placed on the highlands of the Selous. Beho Beho has protected its individuality offering a magical Selous safari destination to you. Beho Beho was the first camp to be sited in the Selous, not on the banks or the flood plains of the mighty Rufiji River, but in the cooler highlands so as to enjoy the cooling breezes from which its name derives. Designed for comfort, Beho Beho's stone built and palm thatched cottages, are not only a refuge from the equatorial sun, the bouncy seat of a game vehicle and the red dust of Africa nor are they just for sleeping, these spacious suites, reveal unrivalled vistas of the Africa bush. The open-sided lounges and dining areas of this camp in Tanzania, together with the cocktail bar and billiards room provide a sophisticated setting for post safari relaxation and the swimming pool and deck, an ideal place to cool off. And when the time comes for interacting with the 55 000 km² of the Selous Game Reserve, there is a family of qualified and experienced game rangers to guide you and to interpret this fascinating natural paradise, either on foot, from a boat on the nearby Lake Tagalala or from an open safari vehicle. 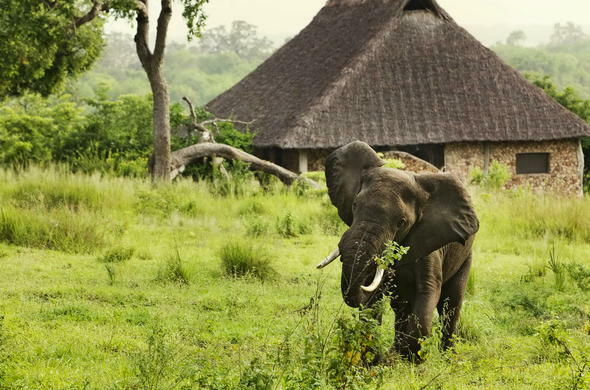 This Tanzania game lodge in Selous is on the crossroads of animal migratory routes. The animals seeming to appear totally unconcerned about the human habitation. Whether it is Elephant, Buffalo, Waterbuck, Giraffe, Wild Dog or Hyena to name just a few, wildlife is often seen wandering through the camp at any time of the day or night. Beho Beho is an ideal location for small residential conferences, seminars and presentations. Private groups are also welcomed at this Tanzania camp. Beho Beho in Selous Game Reserve also caters for special occasions or events like birthdays, anniversaries, special dinners or lunches. Children are permitted to stay only on permission of the directors, but it is felt that this type of camp is really not suitable for children under 12 years old.